Mokuren Dojo: Does this look fun or what?! 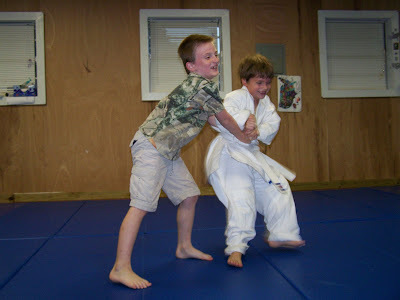 I'm just curious: which would you recommend for kids -- judo or aikido? I'm thinking judo, but what are your thoughts? Folks have successfully taught subsets of both aikido and judo to little kids, so either is possible. But I'd recommend judo. the system and the randori rules, etc... are already designed with all the blatantly dangerous stuff removed and so long as the partners are weight-matched to within about 10% it stays pretty safe. 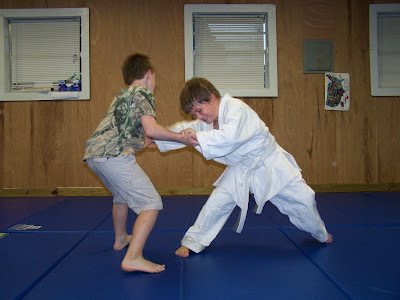 The evasion/avoidance/don't-engage-the-other-guy-mindset of aikido is too esoteric for many kids to get, and you have to avoid all the joint manipulations, so aikido gets pretty flaky with kids. On top of that, kids naturally LOVE to wrestle. I don't think I've ever met a child that didn't enjoy grappling with another child and rolling around. That is a great foundation to build upon. So for my money and time, I prefer judo for kids. We start kids in judo at around age 4 and we graduate them to the adult syllaus around age 12 or 13. we haven't ever had much success starting kids in aiki below about age 13 or 15. Do you have something like this written up somewhere - something like, "here's what I like about Aikido, and here's what I like about Judo?" I just started studying both (really fortunate turn of events) and I would be interested in your input.